So here we are, at the end of another year; its approaching conclusion veiled by the slings and arrows of daily life and the misfortune of believing there was more time on offer. So in a hackneyed attempt to bring us into the moment, we will look to the past year and reflect on the year that is about to complete. Business wise, director Paul Munday reports "It's been a positive year", which is good news and looking forward, Paul feels cautiously rosy. 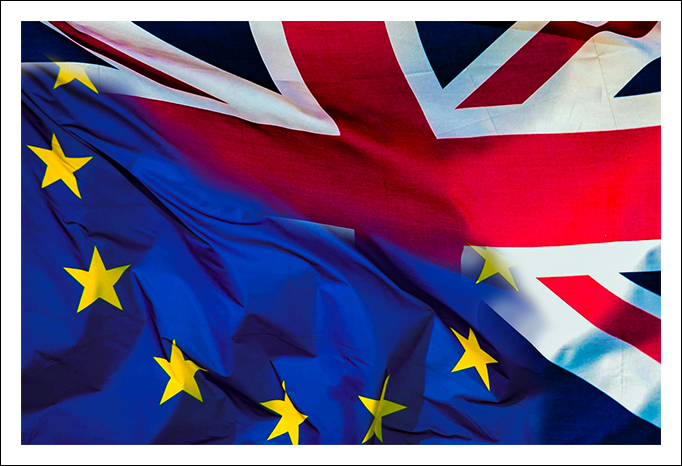 There are the Brexit negotiations, and Paul hopes, as we all do (whether you're a Brexiteer or a Remainer), the ongoing discussions, and the final result, have a positive impact on business. Life in the showroom on Sackville Street, Mayfair, has been lively as ever with our UK and overseas customers, both old and new, visiting us regularly. Alongside our daily going-ons we have discovered a number of hidden treasures. 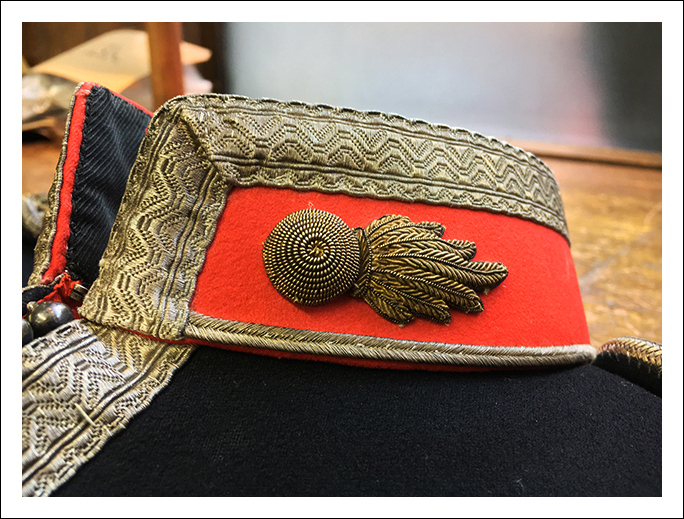 Being in the shop as long as we have (since the last Great War) items get squirrelled away only to be discovered decades later when one is looking for something else entirely. One of which, well two to be precise, were two army regulation books from the 1800s. 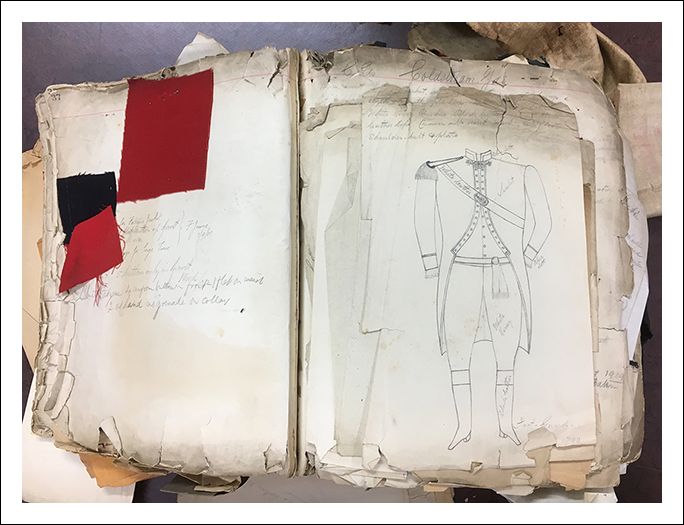 For those who are not aware, an army regulation book is a collection of notes, compiled by a tailor, detailing the intricacies and rules about each regiments' garments: how they are cut, which buttons to use, how and where rank is shown etc. These are definitely not your usual idle note taking entries but beautifully hand drawn and written entries detailing the work we were doing at the time. For those who missed it, please visit our Look Book on our site and page down to Hidden Treasures Parts I & II. 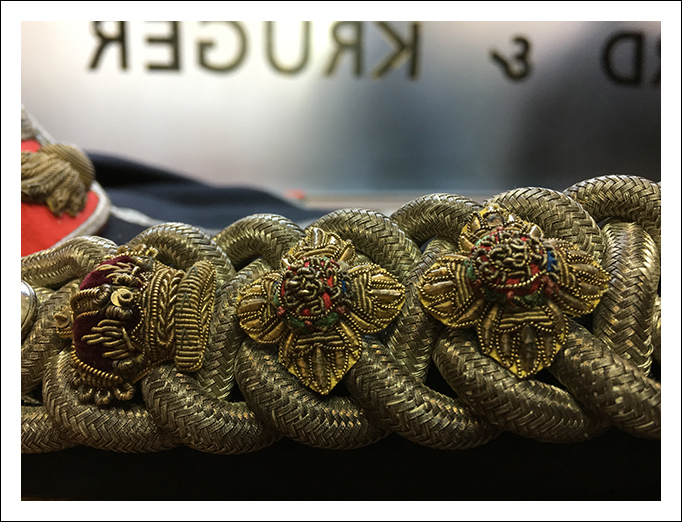 Sticking with our past endeavours, we had a treat, nay two (for they seem to come in twos) when a collector brought in two ceremonial jackets which we had made in 1893 for the Duke of York no less. Those of you who know your Royal Family histories will know this particular Duke went on to become King (George V) in 1910. You can again see both jackets by visiting our Look Book section on our website and scrolling down. It is not every day we get to view the work of our ancestors; and not only that, garments for such a historical Royal figure. Another notable item is a very recent one from this month. 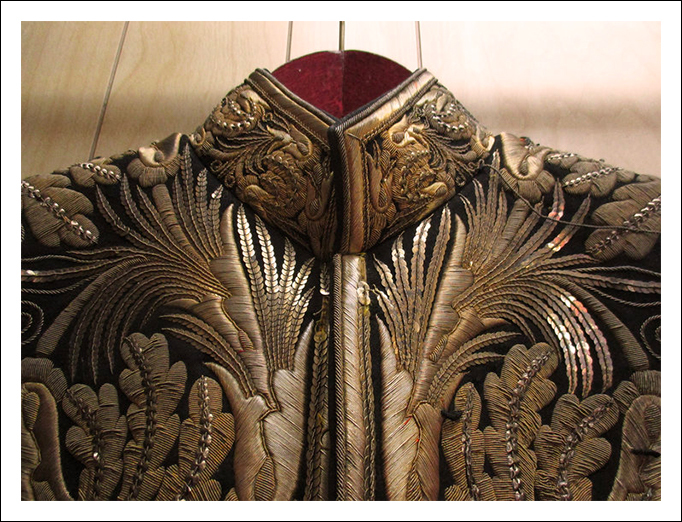 One of our customers bought a very old ceremonial jacket at auction and asked if we could restore it. Neither our customer or ourselves know much about the jacket, but we believe it might hail from the Middle East and be 175 years old. It certainly makes for a fascinating project and the customer, who wishes to remain anonymous, is however very happy for us to share this incredible find with you. For more images click here. 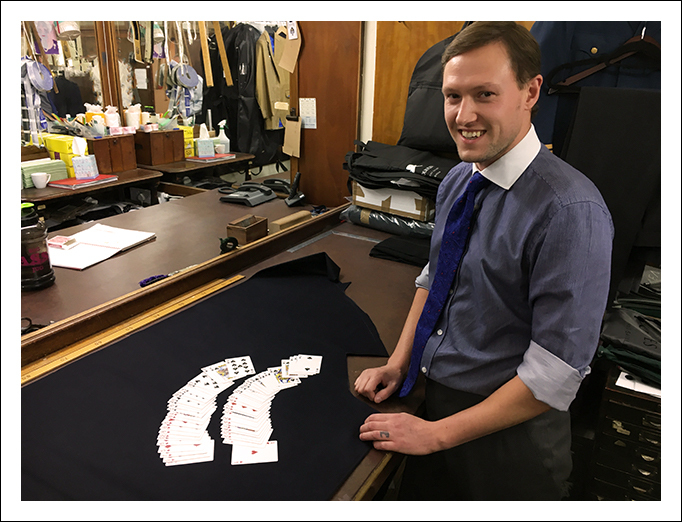 Back to the present, we said goodbye to cutter Oliver Cross who left Meyer & Mortimer to join another tailor's house - and we wish him all the best. In his place came new M&M cutter Steve who has the most challenging surname we have ever come across. Not only does it require constant checking to ensure we spell it correctly, but it also refuses to sink-in and join other knowledge at arms reach. That surname is Phythian. If you would like to know about Steve, and that surname, you can do by visiting his Q&A on our website. As for rest of the core of M&M staff, Paul Munday has been very busy travelling overseas to see our customers in North America and Europe. Fellow director, Brian Lewis, continues to be, alongside his bespoke tailoring duties, Meyer & Mortimer's official historian although he was somewhat stunned by the aforementioned army regulation book find. Other residents at M&M include bespoke shirtmaker Sean O'Flynn, who continues to measure, cut and make his shirts entirely on site. As a music lover, he can be found most days, post-lunch, donning his cans to receive a blast on Exile on Mainstreet. 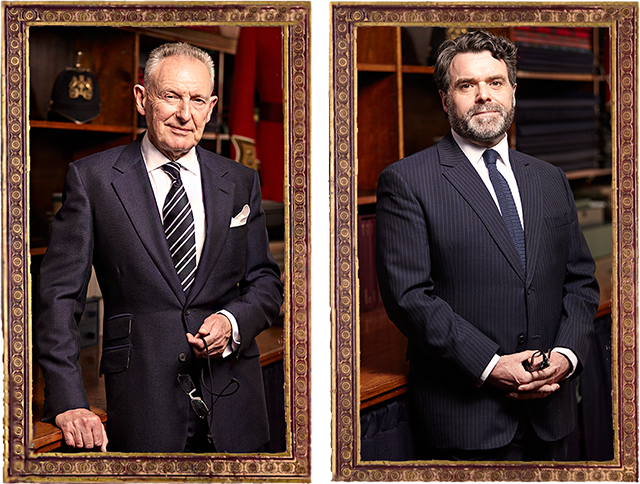 Our other notable resident is fellow Royal Warrant Holder, Malcolm Plews who is considered a bit of a legend around Savile Row. 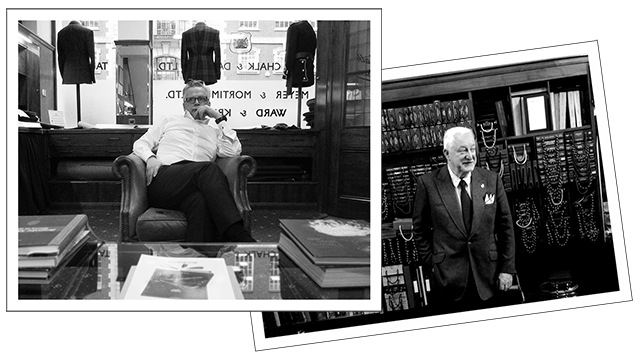 Malcolm is the man you go to when you have a particularly tricky tailoring issue. So it continues to be an honour to have him around at the showroom. You will not find a Christmas jumper on show at Meyer & Mortimer, nor - for some reason - other concessions to Christmas like decorations. However, to avoid being absolutely humbug about Christmas, the-powers-that-be did throw a party the other night at 6 Sackville Street for staff and tailors. 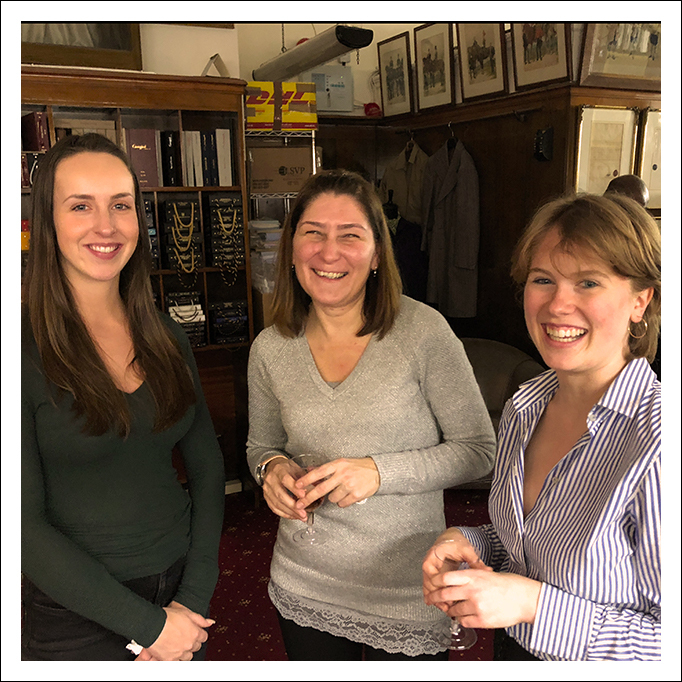 With new tailors joining the family it was an opportunity for them to ascend the spiral stairs and join the cutters in the showroom for a drink or two. It proved to be a fun night, despite the lack of festive decorations. Maybe the Christmas playlist filled in the gaps! Next year, we have an exciting announcement to make, hopefully in January regarding a new direction for M&M. It's not wildly different like say missile tracking or a Christmas jumper range, but for now, we will just say it sits very nicely in our remit and think it will do really rather well. Stay digitally tuned! 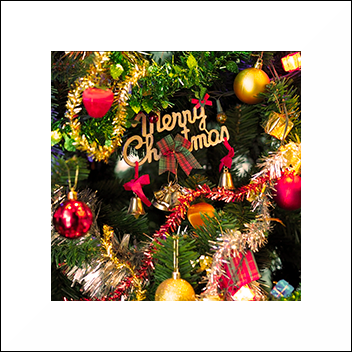 So with the 25th December about to cast aside any remaining camouflage and hit us with its immediacy we sincerely hope you find some peace and relaxation over Christmas.